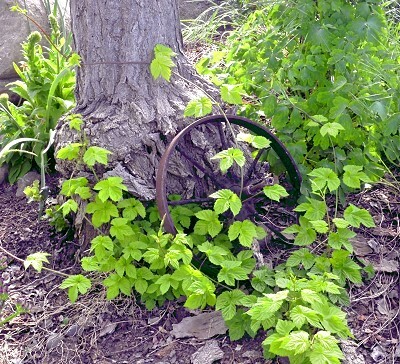 A fast growing vine that is legendary for its inclusion in beer brewing, Hops are grown more often for its ability to quickly cover a trellis or arbor and provide summer shade. It has sand paper like leaves and aggressive tendrils that twine at will. For it to get long and large adequate water is a must. Here, in the southwest, watering every day or every other day encourages the rampant growth and subsequent hop flowers that are needed for brewing or shade. 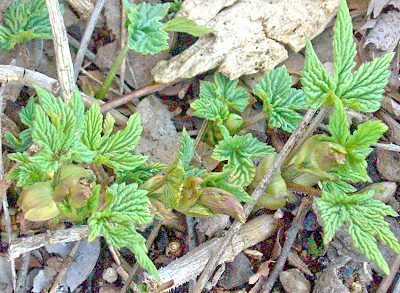 A herbaceous plant, Hops dies to the ground in the winter, and returns in late spring to sprint upward to its 15 to 30 feet summertime growth. After it dies back, getting it off an intricate structure can be tricky, so keep it simple and enjoy the coolness of Hops. It is the Hops flowers that are used in beer, or more accurately the bracts, and while both male and female Hops make flowers, only the ripened cones of the females are used to brew those golden beverages. The picture on the right shows not only the desired hops but how green Sunbeam leaves get in the summer when the hops are ready. Radiant golden Sunbeam Hops (pictured above), rated from Zone 4, can take full sun in all but the hottest summer areas. 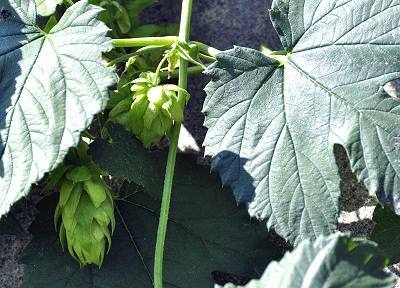 They are not quite as rampant as regular Hops which makes them ideal for patio trellises or window boxes. The golden leaves wind themselves around the tree and become darker as the season progresses. 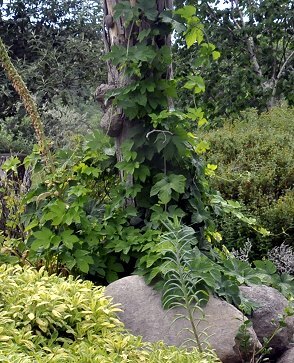 Sunbeam hops will retreat to the ground in winter but emerges each spring with a larger crown and more trailing stems. Truly a stunning addition to any garden. 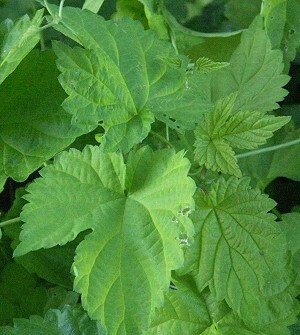 Kent Golding Hops (also referred to as East Kent Golding or British Kent Golding) is a floral hop that blends but does not over power malts used in beer making. 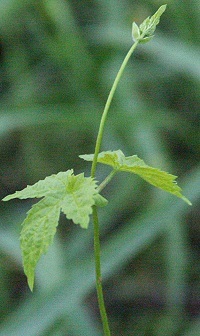 Kent Golding is an aroma hop used frequently in English Ales. Chinook is an bittering hop that is often used in Pale Ales, but can lend itself to other brews giving them an almost smoky taste. Zeus has enormous hops. Used for IPA's. Has a spicy overtone with high alpha acid. Medicinal, Ornamental Hops are not being offered this year. If you would like to see any of these others return to our active list, please email us at customerservice@mountainvalleygrowers.com.